The winemaking bug continues to hit more and more people north of the river, with Clark County now boasting six wineries within a quick drive from Portland. Each winery boasts a unique tasting room, beautiful grounds, and plenty of wine to sample! Bethany Vineyard (map) is one of Vancouver’s oldest wineries, with lakefront grounds so beautiful that weddings are a frequent phenomenon. You can imbibe in a large tasting room with an array of wines just off a cellar of their aging barrels. or set the GPS to 4115 NE 259th St., Ridgefield. Confluence Vineyards and Winery (map) is one of Ridgefield’s youngest wineries, born in 2008 and is just west of I-5 using the 179th Ave. exit. Their first vintages include Petite Verdot, Merlot, Syrah and a Cab blend. Plans for the winery grounds are expansive, with a small ampitheater and enlarged cellars. or head to 19111 NW 67th Ave., Ridgefield. East Fork Cellars (map). Use the 179th street exit to visit the East Fork tasting room as well, straight ahead just north of the exit on NE 10th Ave. Of the six area wineries, this is the easiest to spot and visit. A large retail building features not just this winery but a thriving local seafood business sharing the same parking lot. Their estate, locally-grown grapes include Chardonnay, Pinot Noir and Pinot Gris. or drive to 24415 NE 10th Ave., Ridgefield. English Estate (map) is the most established local vineyard and is located at the Northeast corner of the Cascade Park area in Vancouver. Their stately family-run grounds have welcomed visitors for over a decade to sample a range of Pinot Noirs, white wines, and dessert offerings. or set the GPS for 17806 SE 1st St., Vancouver. Rusty Grape Vineyards (map) is the eastern-most winery of the set. The relatively youthful winery has an expansive and casual event space both outdoor and indoor, with weekly live music events. Available wines include Syrah, Cabernet, Sangiovese, Pinot Noir, Merlot and berry dessert wines. or head to 16712 NE 219th St., Battle Ground. 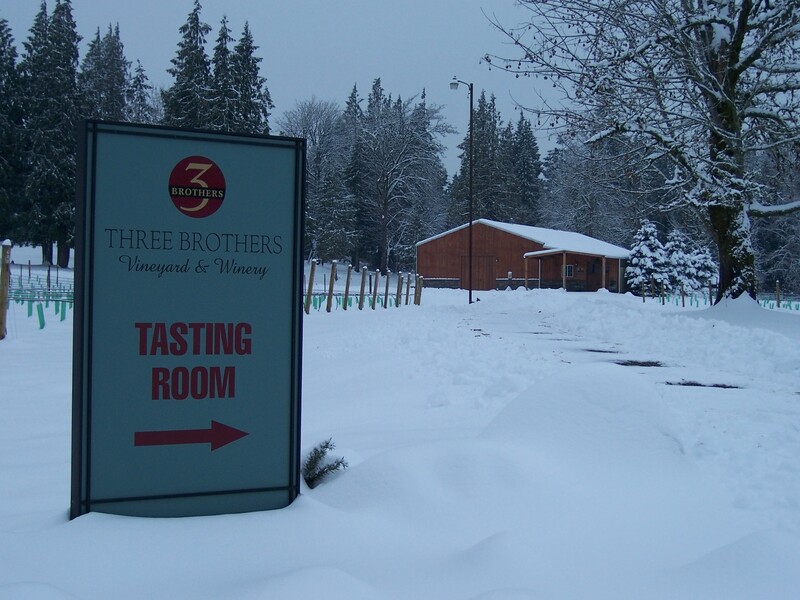 Three Brothers Vineyards and Winery (map) sits directly behind East Fork Cellars. Their local, estate plantings of almost 15 acres include a wide range of grapes: Tempranillo, Pinot Gris, Chardonnay, Pinot Noir, Pinot Blanc, Cabernet Sauvignon, Merlot and Syrah, Gewurztraminer and Riesling. An event room at the winery can accomodate events with up to 40 guests. or check them out in person at 2411 NE 244th St., Ridgefield.